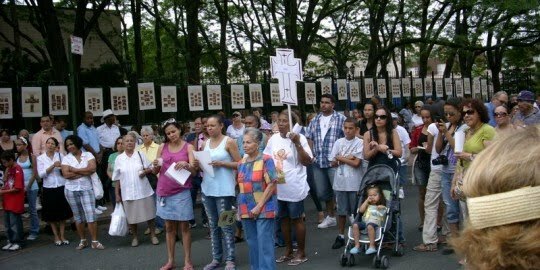 Rebelling against their new pastor, congregants at St. Athanasius Church in Longwood staged an angry demonstration Sunday to criticize their new parish priest for ending a long-standing flea market that served the neighborhood's poor, ousting the beloved nun who ran the market and letting longtime volunteers go. Find the whole story in The Hunts Point Express. As a former resident of this community and parishioner of St. Athanasius Church I was truly appalled and embarrassed to have learned that these individuals would protest in front of the church to oust a priest who only comes to try and continue Monsignor Smith's legacy in bringing the church to its beautiful state as it once was. These "so-called" parishioners who now want Fr. Rivas out are not doing so because Sr. Thomas was outed. Sr. Thomas for many years conducted a flea market outside the church, and while her efforts were extraordinary and kind, 90% of the things that were being sold in that flea market were not in the best condition. As for it being donated, well I know I had witnessed for some time, after Msgr. Smith's passing Sr. Thomas was using the back of the church as you entered as a storage place. Even I at times stated how can this be happening, Msgr. Smith would never have allowed this. I commend Sr. Thomas for all her efforts and her tireless work in the community, but she should be the first to try and work with Fr. Rivas and extend herself in helping him reach his goals and tell parishioners that protesting to oust a priest is not the way to go. I have attended numerous of masses Fr. Rivas has presided over at St. John Chrysostom church where he came from and to say that his sermons and talks to parishioners are inspirational and full of spiritual guidance is an understatement. He is only trying to implement what St. Athanasius was once was when former pastors Msgr. Smith and Fr. Raul Del Valle before him once did. Restore the faith in the community. The priest that replaced Msgr. Smith was in no condition physically to run this parish and for the time he was there everything was amok. You had eucharistic ministers who are only allowed to assist in giving out the communion practically presiding over the daily evening mass because he was not able to do so. Fr. Rivas is only doing what the Archdiocese has asked of him to do, to bring back St. Athanasius to the standards it once and should be. These people should be ashamed of themselves!!!!! Bringing back St. Athanasius to the standard that it once had would be absolutely meaningless if it means doing so by climbing on the back of a noble, caring and selfless person like Sister Thomas while simultaneously splitting a community that has long struggled to coalesce. I don’t know Father Rivas and judging from the parishioners that were interviewed for the HP Express article he too seems like a worthy, albeit “strict” leader. Perhaps that is the type of leader that St. St. John’s Chrysostom on Hoe Avenue needed. That may not be the type of leader SAS needs. The type of leader that St. A’s needs is the type of leader that, back in the 1970’s and 80’s when the buildings were blazing and crime and violence abounded, confronted both City Hall ruffians and Hunts Point thugs equally – with a fearless, level headed determination, unrelenting laser focused persistence and Christ-like compassion. Servants like St. Thomas, St. Rita, St. Mary, St. Jean, Father Jack, Father Connolly, of course Father G, and many, many other saved the South Bronx from itself. One of my first jobs (legal at least) was with St. Thomas/Father G. I learned early on that stature, position and titles are ethereal but serving is graceful and eternal! That lesson has benefitted me and those that I serve well throughout the years. While the 70’s and 80’s may seem to be a thing of the past that type of leadership embodied by Sister Thomas coupled with Christ-like compassion is eternal. Fr. Rivas may want brush up on some of plays from the old play book (the Bible) and revisit the story of Mary and her oil. While many fought for the best position around the table with our Lord, she choose to serve and anoint Him. Those around the table are long forgotten – Mary’s story endures. I wish Fr. Rivas well.